Tiger Muay Thai and MMA Phuket would like to congratulate Tracy Hess Brazilian Jiu Jitsu Brown Belt JJ Ambrose on his recent MMA win on the island of Saipan. Ambrose, a wrestling coach at Tiger Muay Thai is an Alumni of the UFC reality TV show the Ultimate Fighter and has won 13 out of his last 14 professional MMA bouts. Flying 6 hours from Phuket Thailand to the island of Saipan for the fight, Ambrose made weight at 160 lbs before having his opponent withdrawal from the event. Accepting a last minute replacement, Ambrose was forced to fight a professional with a nearly 40lbs weight advantage. 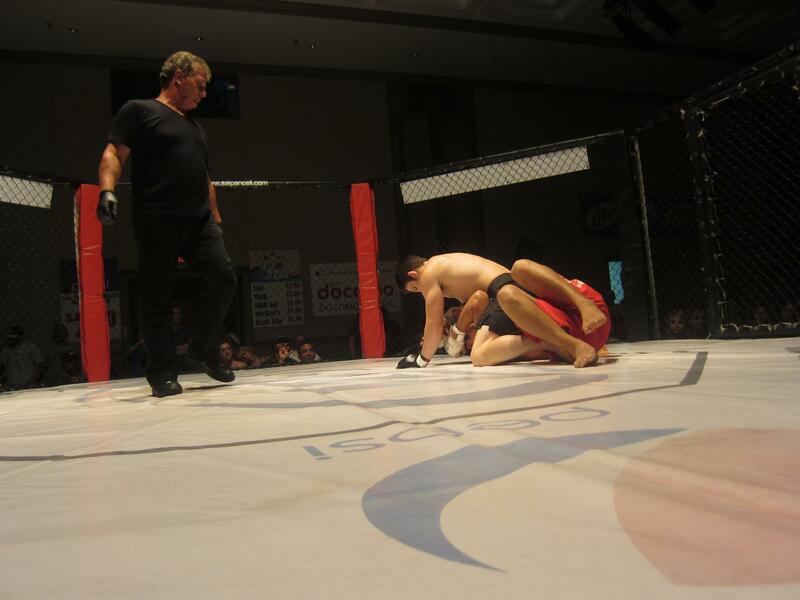 After defending several takedowns, Ambrose had his opponent ‘pull guard’ in an attempt to take the bout to the floor. Utilizing superior ground techniques, Ambrose passed guard and immediately secured the mount before finishing the fight with some vicious ground and pound. With the impressive performance look for JJ Ambrose to sign a contract with a major promotion sooner rather than later.